Baby dolphins, or calves, are approximately 3.8 feet long and weigh around 40 pounds. Baby dolphins gestate for a period between 9 and 17 months, depending on the species. Calves are born live in shallow water and quickly taken to the surface for their first breath. 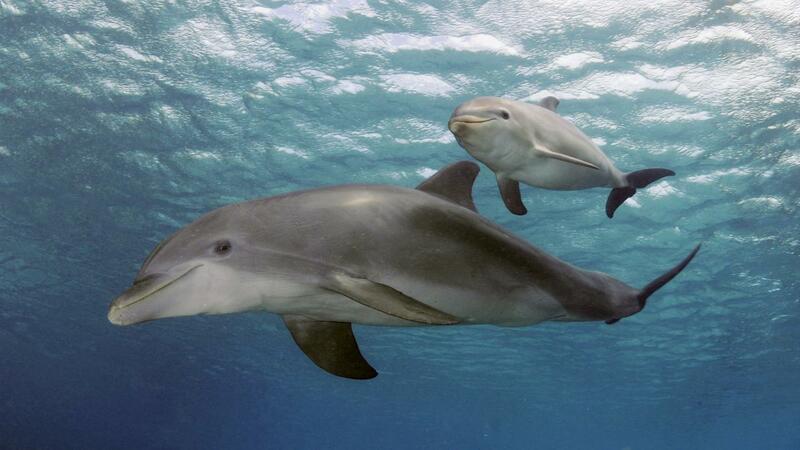 Female dolphins generally birth one calf at a time, and twin births are very rare. Calves nurse anywhere from several months to two years; however, calves do eat some fish during this time, and as they grow, they learn how to hunt for food. After weaning, a calf stays with its mother for three to eight years and generally continues to live in the same dolphin family as its mother, aunts and grandmother. How Does a Dolphin Protect Itself? How Much Does a Whale Eat in a Day? Is the Blue Whale Larger Than a Dinosaur?